RIJSWIJK - TUI Netherlands will end the Amsterdam-St. Maarten route this winter season and transfer its two weekly flights to Royal Dutch Airlines KLM. This will make more capacity available on TUI flights to Aruba, Curaçao and Bonaire. TUI announced this in a press release on Wednesday. The transfer of the TUI flights to KLM is the result of an agreement that was sealed between the two airlines on Tuesday. TUI Netherlands and KLM will be expanding their cooperation substantially and have decided to join forces on a number of destinations. “TUI will turn over its capacity to St. Maarten to the KLM flights starting this winter season and will cease flights to the island. 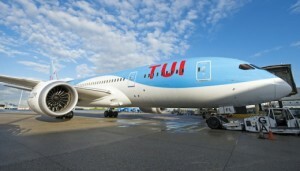 TUI Fly will still fly nine times per week to the Dutch Caribbean,” TUI stated in a press release. No details were given on the exact date when TUI’s St. Maarten flights will end. TUI currently flies to St. Maarten two times per week, on Wednesday and Sunday. Flights are executed with the popular and comfortable 787 Dreamliner aircraft which started to fly to the island in November 2015. KLM announced last month that it will increase the number of weekly flights from Amsterdam to St. Maarten from three to four per November 2, 2017. As of that date, KLM will fly to St. Maarten on Tuesday, Thursday, Friday and Sunday. The KLM uses the Airbus A330-200 on the St. Maarten route. The return-flight to Amsterdam is a direct flight, contrary to TUI which makes a stop-over in Curaçao. The decision to transfer the St. Maarten passengers to KLM will free up capacity on TUI flights to Aruba, Bonaire and Curaçao. Bonaire will get an extra flight and go from from three to four flights per week. There will be more non-stop flights to Curaçao. TUI and KLM will soon start their cooperation on a number of routes, while on some routes the existing flight capacity will be expanded considerably. “We have a lot of faith in this expansion of the cooperation between TUI and KLM, two market leaders strengthening each other. The joining of forces enables us to achieve more growth with new destinations and a bigger seat capacity,” said TUI Netherlands’ General Manager Arjan Kers. KLM is also happy with the cooperation. “KLM wants to fortify its leading position in the business and leisure market, and where possible expand. The market for holiday packages offers that opportunity. Together with TUI we will be able to offer the leisure market a much varied and sharply priced product,” said KLM Netherlands Director Harm Kreulen.